Homemade popsicles are my favorite way to make my boys a treat in the summer time! 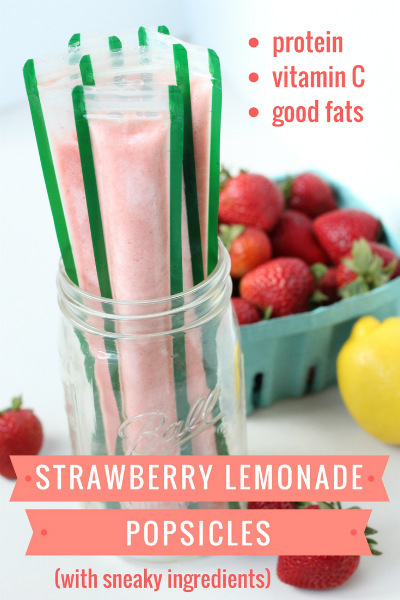 Try my strawberry lemonade version below for a treat everyone will love! Y’all know I delight in being sneaky in the kitchen. Sometimes it’s liver snuck into chili; other times, I throw all kinds of stuff in my morning tea to pack in the utmost nutrition one can in one cuppa. This post is sponsored by Perfect Supplements; scroll to the bottom for a special discount code to save even more on their already reasonably-priced supplements! 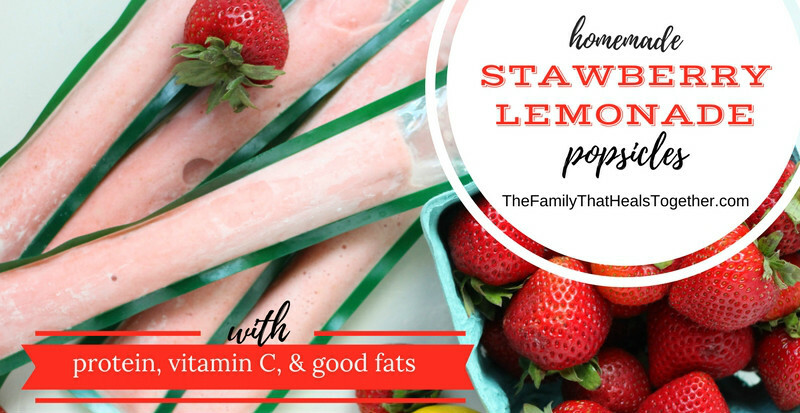 When Perfect Supplements asked me to team up on a summer promotion, I knew the perfect recipe to share- these homemade popsicles that contain protein, vitamin C, and even good fats. I’ve been making them all summer and my kids can’t get enough of them- but they have no idea how good for them they are! While we know homemade popsicles are healthier than their store-bought counterparts for obvious reasons, I like to take opportunities to sneak in gut-healing, immune-boosting, satiating ingredients anywhere I can. 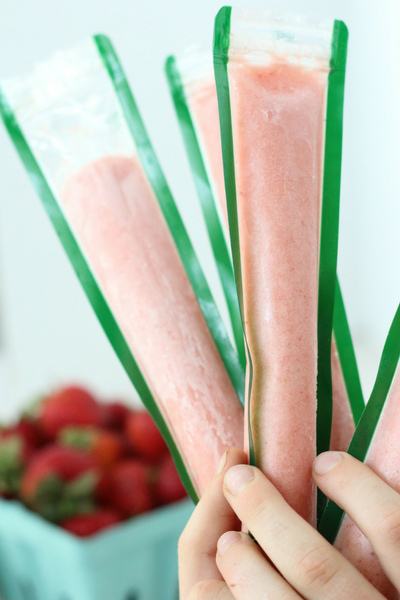 Why give those ingredients to your kids when it’s so easy to make homemade popsicles? Even better, popsicles packed with nutrition?! Not only do conventional popsicles contain all the above yucky ingredients, but they cause kids’ blood sugar to soar, setting them up for a crash later. Popsicles that contain fruit fiber and not just juice help to keep blood sugar more stable. My homemade popsicles take blood sugar stabilization a step further by adding protein and good fats, which helps to slow the sugar rush that accompanies the consumption of fruit and natural sugars. We accomplish turning typical popsicles into a nutrient-dense treat by adding just a few extra key ingredients, none of which change the flavor or texture. I’m a fan of win-wins. I’ve written about hydrolyzed collagen often because it’s truly one of my favorite versatile food-based supplements. 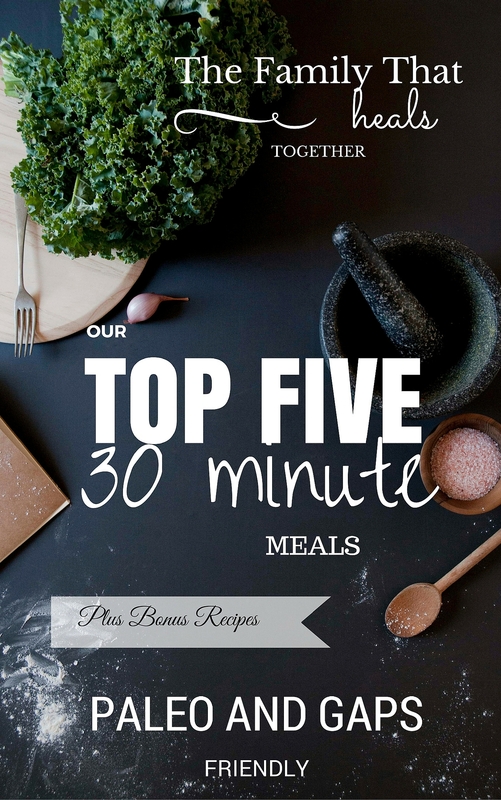 It’s packed full of amino acids, which are good for gut health, hormones, and, in turn, neurotransmitters. You’ll find Perfect Hydrolyzed Collagen in this recipe, which dissolves easily in hot or cold liquids and is flavorless. Get Perfect Hydrolyzed Collagen here (be sure to scroll down to the bottom of this post for a discount code!). Vitamin C is known for its immune-boosting properties. It has been purported to treat everything from whooping cough to cancer, so what better supplement to sneak into homemade popsicles? In my experience, most natural, food-based vitamin C supplements are not potent enough to saturate your body with vitamin C. Instead, I use a more potent form, such as sodium ascorbate. While our bodies produce collagen, they do not produce vitamin C. We have to get vitamin C from our diet and supplements, and then our bodies can create the collagen they need. Get vitamin C powder here. Finally, for good measure, I wanted to get a little fat in the popsicles to further slow the sugar release into the blood stream. If you’ve tried fat bombs, you know that fats help to buffer the body’s absorption of sugars and combining the two can help balance blood sugar. MCT (short for medium chain triglycerides) contains fats that are easy for our bodies to quickly use, sending them directly to nourish the liver. Once easily processed by the liver, this unique saturated fat provides energy to the body and brain. Our family loves Perfect Supplements Perfect MCT oil because it is organic, affordable, and uses superior MCTs. Combining the tasty strawberry lemonade ingredients with the bonus secret ingredients creates a perfect afternoon snack that leaves my kids satiated until dinner time, not an easy feat with sweets! Hint: we’ve been using these reusable popsicle molds! Blend ingredients in a blender until well-combined and smooth. Use a funnel to carefully pour the mixture into reusable popsicle molds like this. Run a little warm water over the outside of the popsicles if your kiddos have trouble pushing the popsicle upward for eating. If you’d like to pick up a tub of Perfect Hydrolyzed Collagen, or any of the other top-notch supplements from Perfect Supplements, use code FAMILYHEALS15 for an extra 15% off through Sunday 7/09/17. Perfect Supplements already offers fantastic prices on multiple items, starting at 25% off of three items and increasing with the more products you buy. You can use the above code to save an extra 15% off of multiple item discounts, plus Perfect Supplements offers free shipping on orders over $100. 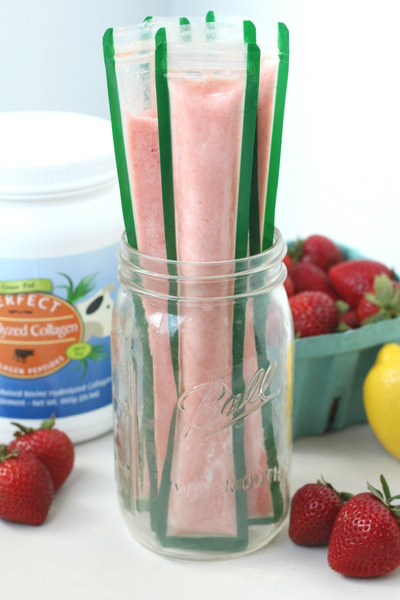 How big is your scoop for the collagen? I’m sure your brand is great, but I’ve already got a different kind at the house, so waste not! Made them and they turned out great. Figured out 2 Tbsp/scoop for the collagen.